As a GM dealership, here at DeFOUW Chevrolet in Lafayette, IN, we believe in the importance of giving back to those who give the most. For this reason, we are proud to announce our participation in the new General Motors First Responder Rewards Program. This exclusive program allows us to offer a special discount to eligible first responders. We can't think of a better way to say thank you to these selfless men and women. Each day, they put their lives on the line, sacrifice their time, and work hard to help keep our communities healthy, safe and thriving. That's why we've opted to offer this special GM discount to all pertinent individuals on all eligible GM models here at DeFOUW Chevrolet. This exclusive GM discount is available for all paid and volunteer firefighters, police officers, sheriffs, sheriff deputies, correctional officers, state troopers, federal law enforcement officers, EMTs, paramedics and 911 dispatchers. Eligible individuals will receive an exclusive discount on select new or unused 2018 and 2017 GM cars, SUVs, crossovers, mid-size sedans, light duty trucks and heavy-duty pickups. Passenger and cargo vans are also eligible. Certain exclusions do apply and these vehicles may change over time, so be sure to ask your sales representative about the discount before you buy. This discount is applicable at our General Motors dealership whether you choose to buy or lease your next vehicle using GM Financing, or any other financial services provider. Plus, you can even combine these savings with most other available offers, to receive an even better deal! If you are a firefighter, a part of the police force, an EMT or a paramedic, all you have to do is create an account online at ID.me. Once you create an account, you will be given an authorization number. When you're ready to make your new car purchase, just bring your authorization number along with a copy of your driver's license with the license number redacted to our GM dealership here in Lafayette, IN. If you are a 911 dispatcher, the process is similar. Log on to ID.me, select "GM First Responder Discount" from the menu, then choose "Get Authorization Number." Follow all of the prompts and then print your authorization number and bring it with you to the dealership. In addition, you will also need a current 911 training and education document or a 911 ID card that contains your full name. Plus, a copy of your driver's license with the license number redacted. This discount is available for first responders only, which means you won't be able to share your discount with other members of your family. However, you can have a cosigner on your new vehicle, and you are allowed to purchase or lease up to 2 vehicles per year with your discount. That means you can use your discount on one new vehicle for you and one for your spouse as long as your name appears on the lease or finance documentation. We know that you don't do what you do for the recognition, but that doesn't mean you don't deserve it! We are so grateful for all that you do, and this is just our way of saying, thank you. 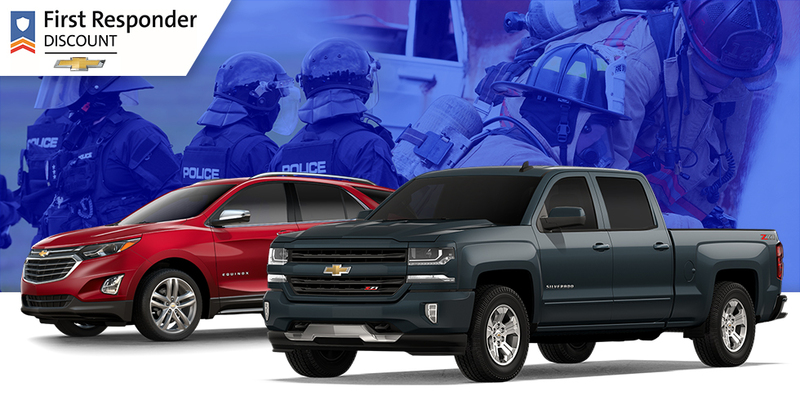 Take advantage of your exclusive First Responder Discount at your favorite local General Motors dealership, here in Lafayette, IN. We are proud to be a part of the community you serve, and we look forward to serving YOU. We're open 6 days a week, and one of our knowledgeable and friendly professionals would be happy to assist you during any of our regular business hours. Fill out the form to schedule your test drive now or stop in and see us here at DeFOUW Chevrolet today!